Project Planning at your fingertips! This is a common understanding of project planning. Though it is not wrong at the same time, it is not entirely correct. From a project management perspective, project planning involves more than just scheduling. Let’s look at typical activities project professionals would do while planning a project. In this post we are going to focus on the task scheduling aspect of project plan. If there is ONE thing that anyone can think about project planning, it is set of tasks. If you have bit of experience with project management, you would call that thing as Gantt Chart. Gantt chart, for decades has been considered really “cool technique” by project managers. The coolest part about Gantt chart is that it is visual. At a glance you get a perfect sense of a project timeline, its complexity in terms of number of tasks, milestones, task dependencies, etc. The days of “exclusivity of project manager” have gone. In the past, Microsoft Project would be seen only on the desk of project manager. S/he would create “project plan” using MS Project, export the schedule to excel/spreadsheet and email that spreadsheet to team members or other stakeholders. If there is any change in the schedule, there would be another version created and emailed again to everyone involved. It gets so complicated, confusing and frustrating to work with MS Project, Emails, Excel-spreadsheet. It is certainly NOT a project planning at your fingertips. Today, the project team needs to be involved, has to be informed, consulted. Time has come for collaborative project management. Team needs to be informed right at the moment, when there is a change in the task they are supposed to work on. ZilicusPM Online project management software has Gantt chart for everyone involved. It ensures everyone refers to only one copy of the schedule. Project team can easily collaborate, discuss/comment about task, share/update documents, link issues/risks to those task, track time agains those task. It is a seamlessly integrated, inter-connected world. ZilicusPM, the online project management tool gives you different ways to control project schedule. Depending on your role (whether you are project manager or team member), depending on your comfort (whether you have worked with Gantt chart or not). ZilicusPM lets you do project planning at your fingertips just in multiple ways, just the way that suits you. If you are a project manager not-so-comfortable with Gantt chart, but prefer to work with spreadsheet like interface, you have it. It is so easy to add tasks, edit names, change start/due date, duration, add subtasks, assign tasks. If you are more into Gantt chart. ZilicusPM gives you the power of advance scheduling with Gantt chart. You can add tasks, recurring tasks, set milestone, set dependencies, set lead/lag time, assign resources with varying allocation levels, view estimated, track actual cost at task level. Project manager can view not only predecessor tasks but also successor task, thus making it easier for him/her to take informed decision before updating task schedule. S/he would know the impact beforehand. 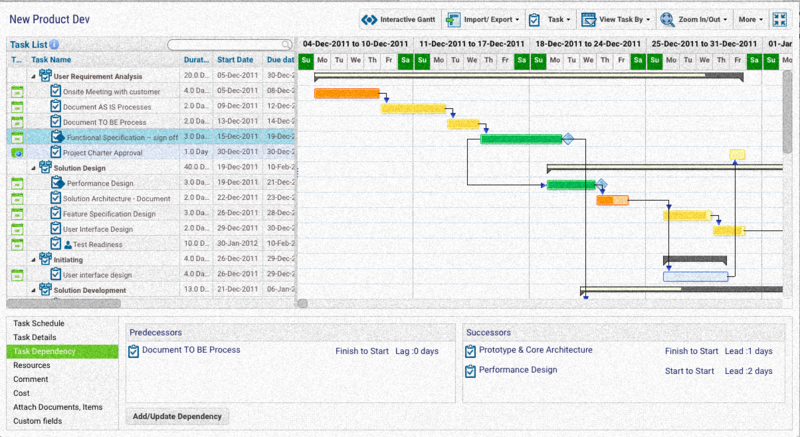 Project managers jump on the Interactive Gantt chart for the super easiness it offers. It is incredibly easy to change task duration, set sub-tasks, set dependencies; all of it using click of a mouse. Sign up for a free trial and give it a try by yourself. Team members need not get bogged down with the complexity of the whole project schedule. What matters them the most is, “Show me my tasks, pending, upcoming and done”. My Project Tasks does exactly that. 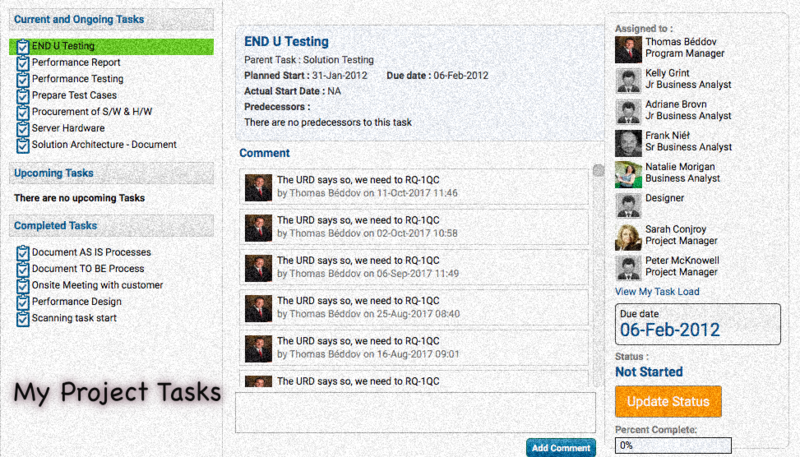 Team member get to see only those tasks assigned to him/her in a given project. Of course, s/he can update status and progress made, add task comments, view/upload documents, link/view linked issues and risks. 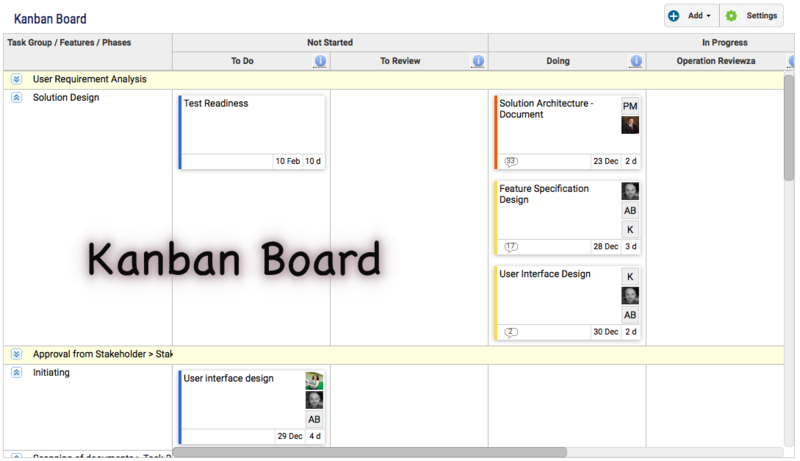 Those who prefer even more visual and simpler approach can use Kanban board in ZilicusPM. Project manager can set custom-states for every tasks in that project. Kannan board will show cards which are as good as task. Each card in turn shows expected start date, who is it assigned to, if there is any attachment, etc. There is a color code associated with the card to indicate priority of the card. In subsequent post, we will look at the other but equally important aspects of project planning.